Fish seek two things in particular: food and shelter. Both of these elements change in the winter, food becomes more scarce, and in many parts of the country so do their options for shelter. As temperatures drop, the stream will freeze; places for fish to hide change and so do the places with greatest food-generating potential. Undercuts by slower moving may get blocked by ice. But, as global warming takes effect and we experience a 65 degree weather in January when it warms up, the ice opens up and reveals a new kind of structure that anglers can target: ice shelves. Some time ago I was reading an article by Ralph and Lisa Cutter in California Fly Fisher. In the article, Ralph describes putting on his winter clothes and dry-suit and diving into a semi-frozen Sierra Nevada lake to observe fish and bugs underwater. He describes diving underneath the large ice-shelf to explore the unexplored parts of a frozen lake. I clearly remember the image of cave diving coming into my mind, but I physically felt very cold while reading his words. While I do not have the article to quote from, he describes finding a big concentration of bugs – midges I believe – right at the edge of the ice shelf. Food? Check. Further, most streams and lakes will not freeze to the bottom. The ice that forms in the majority of parts will be a shelf, meaning there will be plenty of places to hide underneath. A predator coming from above would have to piece through the ice to get to the fish. Shelter? Check! Areas where water is flowing into may stay open and are also likely to have a better amount of food coming in. 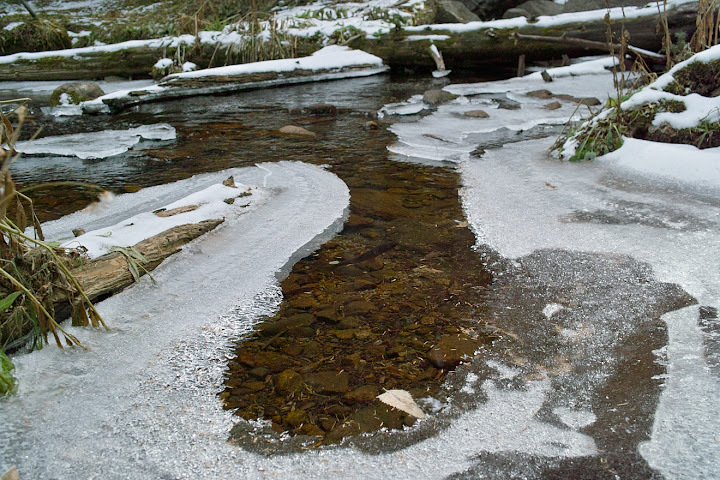 For example, take a look at the foam line in the first picture below, on the opposite side of the stream, the amount of ice there is smaller despite the shadow. And, as they say “foam is home”, as it often indicates places of stronger turbulence that may have taken bugs down as the water plunged into the pool, or water with slightly faster velocity that carries with it some food. I have also noticed fish cruising under ice in places with slower water. In multiple occasions I would see their shadows gliding below the ice. They would come out and often “sip” right by the edge of the ice shelves as in the picture below, reinforcing Ralph’s observation that there are bugs at the edge of the ice. Can you spot the fish in the picture below? This was one fish I did not catch, on purpose. He was very close to the shore, a greenback cutthroat. I spotted him coming from below the ice and eating every time he stepped out of his protected ice cave. He seemed to sip down a bug every minute precisely. I just watched him, in awe, and somehow was able to resist the temptation to cast my fly to him. “Too easy” I thought. Plus, he was having it hard enough with little water that would soon freeze again. It is one of the few fish I have not cast a fly to but remember clearly. I still get as much joy from that memory as from any fish I have ever caught. Glad you have some open water. Here in Leadville our streams and rivers are pretty much totally iced over. Your conditions look a lot like the conditions up here when i quit for the season. I found lots of fish by drifting the kabari just along the ice edge. Most of my ice shelf experience has been scuba diving in lakes during ice out. In a typical scenario where a lake is half covered in ice and half ice free, 80%+ of the trout will be at the edge of the shelf. Not only do they get overhead cover, but they are living under a vending machine. Even in the dead of winter in the High Sierra, bugs are still flying around in the lowland valleys. As the relatively warm valley air rises it carries with it a payload of insects ranging from tiny midges to larger grasshoppers and butterflies. At altitude the carrying capacity of this upwelling air is exceeded and the bugs drop back down to earth. If they land on a frozen mountain lake they get entombed in the ice. During thaw these bugs get dropped out of the melting ice and into the jaws of hungry trout waiting below. This also happens at melting snowbanks along rivers and creeks. Pretty cool, actually. Lots of folk fish SJ Worms during this period under theory that worms are getting excavated in the rising water. Science doesn’t support that. SJ worms might be extra effective because they stand out in murky water, but trout are more likely feeding on thawing terrestrials. 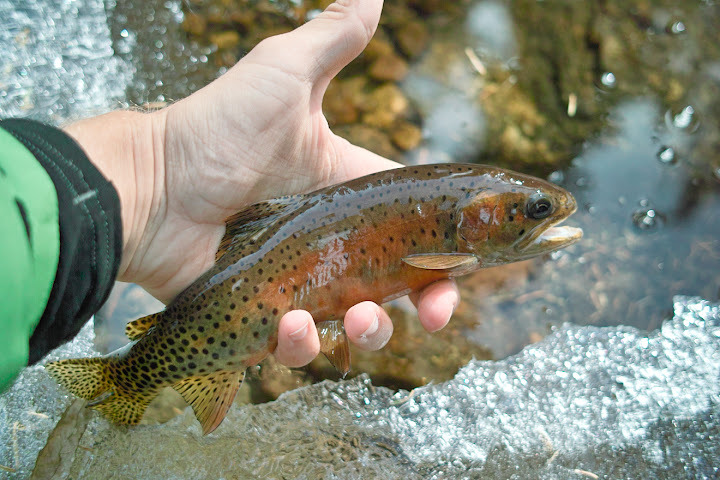 Point for Tenkara anglers: these bugs are dead before they hit the water. Don’t pulse your flies if you are attempting to match the hatch. While diving lakes in the winter usually the only open water is at tributary inlets and along warmer shore margins. 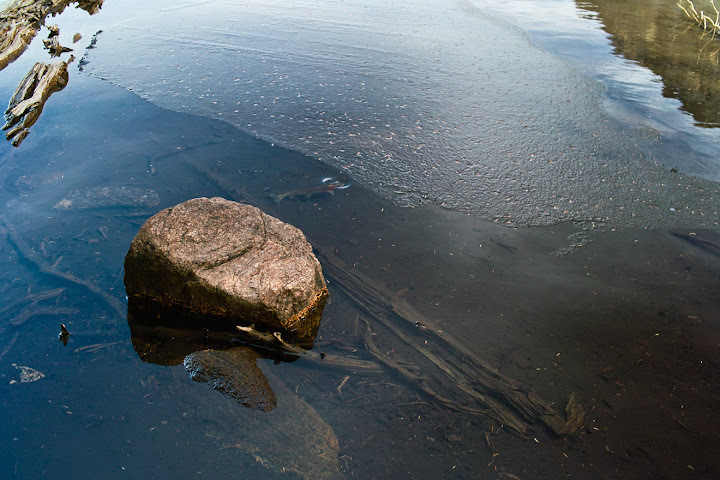 It is in these places that winter midge hatches and some stonefly hatches occur (we don’t normally associate stoneflies with lakes, but there are some very prolific “winter” stones who live in lakes and emerge in the splash zone in February and March). Trout key in on these midges and stones and thus congregate in the open water zones to feed. I’ve done a fair amount of winter under ice diving in rivers and can’t honestly say I have seen any correlation between trout distribution and presence of ice. Not saying there isn’t a correlation, only that it hasn’t jumped out at me. Ralph! Thank you so much for contributing your thoughts to the post. I really appreciate you taking the time to do it, and I’m sure readers here really appreciate having your knowledge shared with them. Great post Daniel. In “Fly Fishing the Mountain Lakes”, Gary LaFontaine writes about how trout would actually follow a streamer that was cast onto the ice until he slid it off the edge and they would take it. Amazing how trout will adapt to temporary structure.